Welcome to my sailing page of internet sailing resources. Please browse though the material or use the table of contents. If you discover items on the net I've missed, don't hesitate to contact me mbrmbr@acm.org, so I can enjoy them and reference them for the use of others. The research group I'm in is very interested in developing tools to help people find items of interest to them in the World Wide Web. We have some ideas, but to better understand how people are currently finding things, if you wouldn't mind, please mail me mbrmbr@acm.org how you found this page, which would be very helpful. Thanks. -- Mark. Other People's Stories - Tales of ordinary sailing adventures! Sailing Related Equipment - hardware, sailmakers, discounters, etc. Learn to Sail Opportunities - on the water, recreational navigation, stuff for kids, etc. Other Sailing Indexes - sites that provide a large number of links and/or host a variety of sailing resources. I participated in the Sail for America, 9/14/02. I created some animated gifs to show how to tie a handful of knots. Info on a 10 day sailing trip I took in the Netherlands. I got an opportunity to be a participant on Northern Light, a 12 meter built in 1938 racing in the WoodenBoat 12 Meter Regatta in September 1997. Herein lies the story. For a class on museum exhibit design, I put together a proposal and model of an exhibit on the Historic American Merchant Marine Survey (HAMMS). In 1992, I sailed on Soren Larsen a 140' brigantine on the Puerto Rico, San Salvador, New York, Mystic, Boston leg of the Columbus 500. To prove what a fabulous experience it was, we even got to see a shuttle launch as we cruised by Florida. See also my short Soren Larsen page. From July 11, 1994 to July 15, 1994 I sailed aboard "HMS" Rose from Erie, PA to Port Stanley, Ont. During the Summer of 1995, I attended the Munson Institute, and took two graduate level maritime history courses. I had a great time. While at Mystic, the Georg Stage visited, and I took some photos as they raised sail at dockside. Cruising on Christmas and weather course. I've taken two courses at the WoodenBoat School. One was a cruising course on the lovely wooden vessel Christmas in 1994 and the other was a week course in understanding weather in 1997. Sailing Page Technical Reports are a series of papers describing technical aspects of this sailing page, or covering more general topics of sailing, computation and the internet. For seven years, I experimented with some ideas on restricted domain search. For those days when 17 syllables is enuf. This is just a really short collection of comments and availability of sailing related movies. A single-handed global yacht race. Annual event, usually in February, that celebrate Chicago's maritime community. This is Sir Robin Knox-Johnston's Round The World Race between eight identical purpose built yachts. Each one has a professional skipper and up to 14 crew who pay for the experience. You are following the run up to the 2004 Olympics, aren't you? A number of the U.S. East Coast schooners gather in October to race down the Chesapeake Bay. Various race and cruising opportunities. Champagne Mumm's Passion for Sailing site. The schedule and info for the tallships in the year 2000 OpSail events. Looks like they were a non-starter for the Whitbread. Ah, well. ASTA is committed to promoting sail training and sea education in North America, providing people of all ages, backgrounds and abilities access to the adventure of a lifetime. 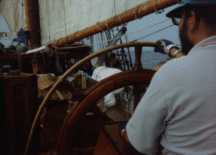 Sail training is adventure travel aboard a tall ship. Schooner sailing the Puget Sound area. A 1928 as an oyster dredger currently sailing the Delaware Bay and River and Coastal New Jersey, with the object of promoting ecological and historical awareness. A 125 foot main topsail schooner. A 130ft 3-masted schooner out of Long Beach, California. AMISTAD America Inc. is a not-for-profit educational organization formed to promote the Amistad replica. Operated by BaySail, and located in Bay City, Michigan and sails primarily on the Saginaw Bay and Lake Huron. The Batavialand shipyard shows how the Dutch have mastered shipbuilding over the centuries; robust ships that were capable of traversing Dutch and international waters. The shipyard will take you back to the world of historical shipbuilding, crafts and the Dutch Golden Age. The famous reconstruction of the VOC ship the Batavia lies docked at the wharf at Batavialand. Built in 1921 for arctic exploration, she's back at it, sailing out of the Maine Maritime Academy. The 1962 MGM Studios replica. I even have a picture. Built for the movie "Mutiny on the Bounty" starring Mel Gibson and Anthony Hopkins. Which operates the Black Jack and the Fair Jeanne. Re-creation of the 1848-vintage Revenue Cutter, C.W. Lawrence. Information on the vessel and its restoration project. Sailing out of Baltimore, Maryland. The classroom of Class Afloat. "Old Ironsides" - Boston, Mass. Permanently at 'anchor' overlooking the River Thames, Greenwich, England. Replica of a three-masted barque used to carry emigrants to the new world from 1845-1870. Co. Wexford, Ireland. The last Frigate to server under sail in the Portugese Navy. Now a museum ship in Lisbon. A replica of the 1606 vessel, Australia's first known European visitor. Information on Elissa from the Texas Seaport Museum. The Endeavour is a full scale sailing replica of the original HM Bark Endeavour in which Captain James Cook made his first historic world voyage of discovery. Replica of the ship that founded Melbourne. Williamstown, Victoria Australia. An ex-steam/sail trawler which has been renovated and rebuilt into a 3-masted schooner. Based in Findland. Originally, the German lightship Senator Brockes, built in 1911. See also sea stories from folks who sailed on her. A 45m barque which has worked the waters around Australia, primarily South Australia, since her purchase in 1923. She was built in Holland in 1919. Salem, Massachusetts reconstruction of a 171-foot three-masted Salem East Indiaman. The Barkentine Gazela, built in Portugal in 1883 of stone pine and now sailing out of Philadelphia. This is the new one. The old one, now called Joseph Conrad, is moored permanently at Mystic Seaport. The new visited the old, and I took these pictures of the new Georg Stage Sail Raising. Replica of Henry Hudson's Half Moon (Halve Maen). One of the vessels used by Ocean Classrooms. With Grays Harbor Historical Seaport Authority, Aberdeen, Washington. Sails on Penobscot Bay, Maine. St. John's Harbour, NF, Canada. Replica of famous Irish famine ship. Cruising the islands of Midcoast Maine. Jens Krogh is a training vessel constructed in 1899 in wood. Based in Sydney during the Australian summer and cruises the South Pacific, based in Vanuatu from May to November every year. Coasting schooner launched in 1871 cruising each year from Memorial Day to Columbus Day from Camden, Maine. Madeline is a reconstruction of a mid 19th century fore and aft schooner built by the Maritime Heritage Alliance, a non profit organization based in Traverse City, Michigan. Please see their website for the other historic vessels they own. Oyster Skipjack sailing in the Chesapeake. Reproduction of John Cabot's ship. The Morning Star Trust is a Christian sail training organisation based in Chatham Historic Dockyard on the River Medway. The Trust operates a 62ft gaff rigged ketch Morning Star of Revelation taking young people sailing in the Thames Estuary, off the East Coast, and, weather permitting, further afield to ports in France, Belgium and Holland. Sailing off the coast of Maine. Reconstruction of Commodore Oliver Hazard Perry's flagship in the battle of Lake Erie. Sailing out of Erie, Pennsylvania. North End Schooners is a loose association of 2 traditonal wooden sailing vessels, Heritage and, American Eagle. They are located in Rockland, Maine and are dedicated to preserving Maine's maritime heritage by offering windjammer cruises that allow passengers to experience life at sea. A three-masted topsail schooner which allows interested parties to participate as passengers on cruises to distant destinations. 102 ft ketch owned by the Canadian Navy and used for training of Regular and Reserve Canadian Navy members. The 178 foot 3-masted steel barque will be starting an 18 month round the world voyage westward bound in the tropics with expense sharing crew and cargo. Getting underway October 1997. See also, Picton Castle. A full-sized replica of the square-rigged vessel on which Richard Henry Dana sailed into Dana Point Harbor. Owned by the Ocean Institute. The Spirit of Dana Point is a traditionally built, accurate replica of a 1770's privateer used during the American Revolution. Owned by the Ocean Institute. A 110' foot replica of a 1775 War Sloop, currently sailing out of Providence, Rhode Island. A two-masted, gaff-rigged centerboard schooner operated by Schooner, Inc., a non-profit marine education organization dedicated to the conservation of the environment, particularly Long Island Sound and the rivers of Connecticut. The ex-customs cutter "RIGMOR", Germany's oldest seagoing sailing vessel of 1853. A 50 metre brig run by LebenLernen auf Segelschiffen e.V. Last of the Gloucester Grand Banks schooners in regular service. Roseway sails the coast of New England summers and the Caribbean winters. Individual & Group inquiries invited. Offshore re-positioning trips spring and fall. Replica 18th century gaff rigged square tops'l dispatch gunboat/bomb ketch. Based at Opua, in the Bay of Islands, New Zealand. Operated by Brigantine Inc., a non-profit youth program for boys and girls, age 13 to 18, which started in 1953 and is one of the oldest sail training programs in North America. Kingston, Ontario, Canada. Sail and Life Training Society is non-profit Christian organization that is dedicated to youth training under sail. They built and operate the schooners Pacific Swift and Pacific Grace. Home port for these vessels is Victoria, BC, Canada. Replica of vessel used in Japan's first diplomatic mission to Europe in 1613. Dockside in Miyagi, Japan. Schooner is a private, non-profit marine education organization dedicated to the conservation of the environment, particularly Long Island Sound and the rivers of Connecticut, and appreciation of their culture, history and future. They operate the 91-foot sailing research vessel Quinnipiack. Offer opportunities in education, combining the worlds of science and humanities with a once-in-a-lifetime experience on a sailing vessel at sea. Operate the SSV Robert C. Seamans and SSV Corwith Cramer. Page of BE-11 Simon Bolivar Venezuelan Tall Ship. Also see my short Soren Larsen page, and my Columbus 500 adventure. The schooner used by SoundWaters, a nonprofit environmental education organization dedicated to the restoration and preservation of Long Island Sound and its watershed through hands-on learning and public awareness. Spirit of Adventure Trust. New Zealand based. Another site. and another. A modern version of a nineteenth-century clipper. Owned by the association "Verein zur Forderung der Segelschiffahrt e.v." Stahlratte was built in 1903 in Holland as a sailinglogger and since 1984 has been sailing in international waterways. Sailing out of Rockport, Maine. Replica of a 18th century schooner based in Chestertown, Maryland. Brigantine sailing out of the Netherlands. 29 meter schooner owned by Tabor Academy, Marion, MA. Indian Navy three-masted Barque training vessel. Day sailing out of Gloucester, Massachusetts. The Schooner Timberwind sails for 3, 4, and six day cruises on the coast of Maine. Traditional sailing at it's best with no engine on board and woodstove cooking. Windeward Bound is a brigantine 24.1 metres in length, with home port of Hobart, Australia. Australia's sail training ship, operated for the Young Endeavour Youth Scheme by the Royal Australian Navy. Three-masted schooner part of the Maine Windjammer fleet. Based in Seattle, Washington, and is available for day sails as well as longer sailing retreats on Puget Sound and Lake Washington. Sails on the Dutch Waddenzee. The Swedish Cruising Club Sail Training Foundation (english) which operates three traditional sailing vessels vessels, Gratitude, Gratia and Atlantica. The Sausalito Tall Ships Society (STSS) is a non-profit organization dedicated to educating people in traditional nautical skills and supporting the operation and preservation of traditional sailing vessels, particularly tall ships. The Association of Sea Training Organisations - is an "umbrella" association which exists to represent the major sail training schemes in Great Britain. Its purpose is the education and development of young people of all nationalities, religions and social background through sailing. Its subsidiary company Sail Training International Events Limited organises the Tall Ship's Races (for sail training vessels), conferences and seminars. Includes unofficial description of STA, and also description of vessels STS Sir Winston Churchill and STS Malcolm Miller. An organization whose goals include promoting sail training courses aboard tall ships from different countries. An organization dedicated to promoting public tall ship events and festivals and an exchange of cultural experiences between, but not limited to, North and South America. MBV operates three sail training vessels: Hawila, Astrid Finne, and soon Gunilla. The Northwest Schooner Society was established in 1994 to preserve schooners and to introduce more people to the thrill of sailing classic ships. Currently, they operate the schooners Zodiac and Martha. Fleet of Square Riggers. Facilities for Film and TV. Training course. Operates the schooners Manitou and Malabar out of Traverse City, Michigan in lakes Michigan and Huron. Where physically disabled and able-bodied people share the challenge of crewing a tall ship at sea. Southampton, England. Mostly it is useful because it has a list of national sail training (tallship) organizations. Many of them have Web pages! More tallship links that have overflowed from this page. This is oriented to the stuff I'm interested in. Also check out my more normal Sailboat Chartering page. It's not that these organizations don't have your nice sunny charters, but that they also have the more out-of-the-way opportunities. Information and route of this great vessel. See my Columbus 500 adventure for instance. A broker I have used to find interesting sailing opportunities. About The Arctic Explorer Project... or why on earth does anybody want to travel to cold and remote areas? The idea behind these expeditions is to sail to the areas & spots of the Arctic that are inaccessible by other means of transportation. By using a sailing boat, we can attain that with a maximum of comfort and a minimum of noise and pollution. This is a collection of sites that provide matching services to help crew find boats, and boats find crew. Aberdeen Maritime Museum is currently housed one of the city's oldest surviving buildings known as Provost Ross's House (right) in the Shiprow. Through outstanding collections of maritime fine art, historic ship models, drawings and objects the Museum tells the fascinating story of the North East's long association with the sea. The Foundation runs the Craddock Boat Building School, restores historic watercraft and conducts a marine environmental sciences program. Alexandria, Virgina. Of the United States Merchant Marine Academy, Kings Point, NY. American Victory is a 1945 built merchant marine vessel of the victory class. Tampa, Florida. Preserving the boats, engines and artifacts, the people and skills that developed them and their influence on life along the St. Lawrence River. Clayton, New York. Dutch National Museum of Dredging at Sliedrecht, Netherlands. Five ships including U.S.S Joseph P. Kennedy, Jr., the Battleship Massachusetts, and the MGM replica of the HMS Bounty. Located on the shore of Lake Superior at the Duluth Ship Canal. Part of the Boston National Historical Park in Boston, Mass. Located on a peninsula in the harbor of historic and picturesque St. Michaels, the Chesapeake Bay Maritime Museum has grown from a single house when it was established in 1965 to an 18-acre campus of restored buildings and new structures erected to exhibit a comprehensive collection of Bay artifacts and to preserve the cultural heritage of the Chesapeake Bay. Port Hueneme, California. Also annex located in Gulfport, Mississippi. Also see CEC/Seabee Historical Foundation. The Clyde Maritime Centre is located at Yorkhill Quay, Glasgow. Marine Navigation at the Deutsches Museum in München, as well as many other maritime related exhibits. German Maritime Museum. Bremerhaven, Germany. Replica of the Royal Naval establishment at Penetanguishene, Ontario, Canada. Includes replicas of H.M.S. Tecumseth and H.M.S. Bee. Sturgeon Bay, Wisconsin. (On Lake Michigan). Greenport, Long Island, New York. The Erie Canal Museum is located in Syracuse, NY, on the site of the original canal that once passed through the heart of the city of Syracuse. The museum features many exhibits of canal era activities, including the construction and the influence that the canal has had on the economic and cultural development of upstate New York. Includes a museum and the Story Shipyard. Essex, Massachusetts. Exhibits the general history of shipping and fishing in Estonia. Tallinn, Estonia. Jeddore Oyster Ponds, Nova Scotia, Canada. Fisheries and Maritime Museum, Esbjerg, Denmark. The focus of the collections has been on the technical history of ship and small craft design, construction, and propulsion. The majority of the material is from the New England area in the late 19th century and the 20th century. As this has mirrored the work done in the Department of Ocean Engineering, the collections also contain items from the department's history. Physically, the holdings consist of drawings, books, models, photographic materials, marine art and artifacts. Danish Maritime Museum, Kronborg, Helsing, Denmark. Includes a nice virtual exhibit: Captain Cook: Voyage of Discovery and promise of an upcoming one on the Vikings. Located on Philadelphia's historic Penn's Landing. Dr. Robert Ballard's institute, associated with the Mystic Aquarium. USS Intrepid moored in New York City Harbor. History of shipbuilding, shipbuilders and ships of Sideby in Southern Ostrobothnia, Finland. Over 130 sailing vessels were built on the shipyards of Sideby between 1828-1920 (in Swedish). Founded in 1962, Maine Maritime Museum collects, preserves and interprets materials relating to the maritime history of Maine. It is located on the banks of the Kennebec River in Bath. There are more than 35,000 artifacts, 500,000+ photographic images and negatives, as well as one of the largest Maritime library collection in the Western Hemisphere ( over 75,000 volumes in the collection). Gosh, and a bunch of it is starting to appear online! Collection contains artifacts representative of those used aboard sailing, steam and small craft on the Great Lakes; 8,000 titles in the library covering most aspects of Canadian marine activities; design drawings, shipyards, builders plans (30,000 items); private and corporate papers, cinematic, video and audio tapes; database of 4500 ships registered at ports on the Great Lakes mostly from the 19th century. Includes info on research services. Portugal War Navy Museum. Lisbon, Portugal. Swedish Naval Museum. On the island of Stumholmen, which lies close to the centre of Karlskrona. Features exhibits, artifacts, photographs and historical documents from the Royal Canadian Navy. Halifax, NS, Canada. The Maritime Museum of the Atlantic is the marine history division of the Nova Scotia Museum. This unique museum, located on the revitalized Halifax waterfront, offers visitors many opportunities to discover Atlantic Canada's maritime heritage. The Marquette Maritime Museum tells the story of the Maritime heritage of Marquette and Lake Superior. Located in Marquette, Michigan. The Mary Rose was a four masted warship, built on the orders of Henry VIII between 1510 and 1511. After a long and successful period of service she sank accidentally during an engagement with the French fleet in the Solent in 1545. Her rediscovery and raising were one of the seminal events in the history of nautical archaeology. The ship was raised by and is being cared for by the Mary Rose Trust. There is also news. Miyagi, Japan. (I currently only have a link to their vessel). On January 30, 1975, the U.S. designated its first national marine sanctuary. The site was the wreck of the USS Monitor, a Civil War vessel that lies off the coast of North Carolina. The Maritime Museum was founded by King Luís on July 22nd 1863 in Lisbon, Portugal. Includes history of the museum and images from their collection. Explores the story of London's River. London, UK. Maritime archeology center. Townsville, Queensland, Australia. Mystic Seaport is a non-profit museum whose mission is to tell the story of America and the Sea. Founded in 1929, the Museum has become the largest institution of its kind, with 22,000 members, 450,000 annual visitors, and more than two million items in the collection, including the largest assemblage of historic watercraft in existence. The museum in Greenwich, London. The National Maritime Museum Association is a non profit organization dedicated to maritime preservation and education in order to enhance public understanding, appreciation and enjoyment of our national maritime heritage. The Association assists, and encourages community participation in and support of, the San Francisco Maritime National Historical Park, a unit of the National Park Service. Information on this museum located in Haifa. NAUTICUS, The National Maritime Center. A family-oriented nautical "theme park" with over 150 interactive, and fun, exhibits relating to the sea and man's relationship with it. U.S. Navy. Washington Navy Yard, Washington, D.C. This museum tells the story of English Harbour and of the people that toiled and sweated in this naval yard. It will also explain the 20th century return of sailing ships and the aims and aspirations of Nelson's Dockyard National Park. A library and database of Caribbean naval history is available for researchers. - St. John's, Antigua, West Indies. Commemorates the history and heritage of New Bedford as the world's leading port for the whaling industry. New Bedford, Massachusetts. Home of the submarine: USS LING SS-297. Hackensack, New Jersey. Croton-on-Hudson, New York. The museum operates the Half Moon, a reproduction of the ship that Henry Hudson sailed from Holland to the New World in 1609. Celebrates New Zealand's maritime heritage and the voyaging traditions and craft of the Pacific. Auckland, New Zealand. Nobska News is the official newsletter of the New England Steamship Foundation, the non-profit society dedicated to the preservation of the S.S. NOBSKA, America's last coastal steamship. The Norwegian Maritime Museum located in Oslo. The North Carolina Maritime Museum documents, collects, preserves, and researches the maritime history--and its corollary natural history-- of coastal North Carolina for the purpose of interpreting this history through educational services and exhibits for our contemporary society, and passing intact its material culture to future generations. New Bedford, Massachusetts. intact its material culture to future generations. Includes an interesting section on Maritime Art and History. A working steam port. Echuca, Victoria, Australia. The British Royal Dockyard, the Royal Naval Museum along with the vessels, The Mary Rose, HMS Victory and HMS Warrior 1860. Working to establish a permanent Maritime Heritage Center, they currently exhibit materials at a variety of Seattle, WA sites. Dedicated to preserving the heritage of the maritime history of the Virginia Chesapeake Bay area. Reedsville, Virginia. U.S. National Park established to preserve and interpret the maritime history of New England and the United States. Salem, Massachusetts. New Westminister, British Columbia, Canada. Including info on the Star of India. Also check out the pages by the National Maritime Museum Association about this U.S. National Park, including information on their historic vessels. Netherlands Maritime Museum, located in Amsterdam, Netherlands. Home of the steamship Ticonderoga. The Ticonderoga is America's last remaining side paddlewheel passenger steamer with a vertical beam engine of the type that provided freight and passenger service on America's lakes and rivers from the early l9th to mid-20th centuries. A registered National Historic Landmark, the Ti was commissioned by the Champlain Transportation Company and built in 1906 at the Shelburne Shipyard on Lake Champlain. Overview from the National Museum of American History. The Hall of American Maritime Enterprise portrays three centuries of ocean and river commerce with photographs, objects, films, and models of sailing ships and steamships. The National Maritime Museum of Sweden. Stockholm, Sweden. U.S. Army Corps of Engineers facility describing the history of locks on the Great Lakes. Sault Ste. Marie, Michigan. An exhibit at Musée de la marine in Paris, placed online by The french ministry of culture and francophonie. I haven't found a pointer to the museum itself, yet. The South Street Seaport Museum occupies the site of the original port in lower Manhattan, New York City. This eleven-square-block historic district of stone-paved streets and eighteenth- and nineteenth-century buildings takes its name from the renowned "Street of Ships," and is now home to the museum's fleet of historic vessels. The Stavanger Maritime Museum is a department of Stavanger Museum. Stavanger, Norway. The Swedish Historical Diving Society was founded in 1979 to save the old Navy escape training tower for future generations. Located in central Stockholm and near the Vasa museum. The Noble Maritime Collection, is a museum and maritime study center located on the historic grounds of New York's Staten Island's Snug Harbor Cultural Center. Showcases the rich maritime history of Southern Ocean County, New Jersey. Tuckerton, New Jersey. Donostia / San Sebastian, Spain. Located in Waesche Hall on the grounds of the U.S. Coast Guard Academy in New London, Connecticut. Museum devoted to the U.S. merchant seaman of World War II. Anderson, Indiana. Home of the USS Nautilus. Located on the Thames River in Groton, Connecticut. In August 1628 the royal warship Vasa heeled over and sank on her maiden voyage, before leaving Stockholm harbour. The Vasa was the most expensive and perhaps most richly decorated naval vessel that Sweden had ever built. She was the King`s pride and the mightiest naval ship of her time. In 1956 Anders Franzén found the ship and initiated one of Sweden`s largest ever projects of marine archaeology. There is also a museum overview. Viking Ship Museum in Roskilde, Denmark. This organization is associated with the Beverly Historical Society & Museum in Beverly, Mass and have around 100,000 photos covering all forms of transportation in New England. A good number of them cover ships and boats in and around New England. They also have a collection of books and other related material, pertaining to nautica. All material is avaiable to the public. The Western Australian Maritime Museum is part of the Western Australian Museum. It is located in Fremantle and consists of the Maritime Museum, the Historic Boats Museum as museum venues and the Departments of Maritime Archaeology, Maritime History and Education. The William G. Mather is a retired Great Lakes Bulk Freighter. In December, 1987, the Steamer William G Mather was donated to The Great Lakes Historical Society. In October 1990, she was moved to her permanent berth at the East Ninth Street Pier on Cleveland's North Coast Harbor. Presents history of the ships of Lake Michigan. Exhibits include the WWII submarine USS Cobia. Located in Manitowoc, Wisconsin. Located in the heart of the Victorian Seaport of Port Townsend, Washington. Some stuff I've collected about maritime sites in the NY - NJ area. Website for a newsletter that provides information about maritime heritage activities throughout New England. A professional guild of institutions, organizations, and individuals in the maritime-preservation field, dedicated to international friendship, collegial cooperation, and mutual understanding. Gopher information on maritime and naval museums in Greece. A listing or hypertext of maritime museums. Look here for for museums in the UK. The first listing is collected from sci.military, and is definitely biased toward places that have boats, especially ones of military significance. The second is the first augmented. The last is UK only. Or more formally: Robert H. Smith's Master Index of North American Maritime Museum Internet Resources. The majority of this section is now located at other sailing resources, but I thought I'd leave a handful of sites as a teaser. Two locations of the rec.boats FAQ maintained by jfh@cs.brown.edu (John Forbes Hughes). Here is some info on his boat Sarah. Samples of of photographs held by PPL by subject. Sailing images from Andrew Sims, Marine Photographer. I have to admit, I much prefer the original Segar Popeye to the later versions. The International Maritime Organization (IMO) is the United Nations' specialized agency responsible for improving maritime safety and preventing pollution from ships. Information on the Canadian Coast Guard and boating in Canada. International Marine Signal Flags, semaphores, some national flags and the comprehensivePub. No. 102: International Code of Signals. My vessel is a dangerous source of radiation; you may approach from aft. This account is intended to provide an easily accessible data base of tidal heights and winds along the U.S. east coast. See README file. These are a sample of GPS information available on the net. This is a small sample of NMEA 0183 information available on the net. I haven't been following this very carefully, so there are probably better references. This is where I've moved all those other sites, that weren't easily catagorized, but yet I found interesting. History: The early history of this site is clouded in the mysteries of my forgetful memory. Initially, the site started out as a page of my sailing bookmarks. Soon after that I, created the site. The earliest file, which I still have, (tall-ships-faq) was modified on June 18 1993. I moved the site off my personal machine when my company installed their first firewall onto an SGI Indigo R4000 called community, located outside the firewall. My log files from that machine begin June 13, 1994. In September 1996, I established the domain apparent-wind.com and in August 1997 began moving visitors from the community machine to apparent-wind.com. In late summer 1998 I turned community off and all traffic is now served from the apparent-wind.com domain. Page last updated: Feb 27 06:38:56 2010 MDT. Copyright 1993-2015 Mark Rosenstein. Disclaimer.